as we know it today." Perhaps the foremost play-by-play announcer in America's sportscasting history, the late Ted Husing was largely responsible for play-play broadcasting as we know it. His unique ability to capture the drama of sports as it was played out on the field, and to effectively communicate that drama to the listening audience, helped advance, helped advance sportscasting to the exciting medium that it is today. 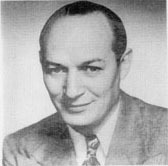 Husing began broadcasting in 1924 for RCA-WJZ when he won a radio audition job over 619 rivals. His first sports assignment came in 1925 and was followed by many years of exemplary sports broadcasting with various networks, including CBS and ABC. Husing's broadcasting style has been described as concise and crystal clear. His smooth delivery and easy speaking manner transcended many a dull game, making him a favorite with the listening audience, and ensuring his lasting success in the sportscasting profession.